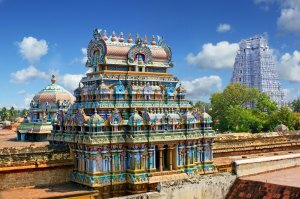 City located in India, in the state of Tamil Nadu, Madurai has more than 1 200 000 inhabitants, and it is famous for its many temples. Its history goes back 2,500 years. Built on the banks of the Vaigai River, it is also known for its jasmine flowers, and it was also a major literary center from the 1st to 3rd century AD. The city is teeming with people and traffic, bicycles and cows! One of Madurai's strong points is the Minakshi Temple, a masterpiece of Dravidian architecture, dedicated to Shiva's wife, with its profusion of intense color sculptures on the walls and portals, valued at 33,000 and its two sanctuaries: it represents one of the most sacred places in the country, and one comes to marry or purify oneself there. The interior offers a real labyrinth to explore in several hours. One can also stroll in the bazaar facing the temple, observing the multitude of objects that are sold, jewelry, artificial flowers, scarves, cotton. See also the Gandhi Museum, which exhibits the life and personal belongings of Mahatma, a very complete testimony about the great man; the palace of Thitumalai Nayak, built in 1636, of which there remains only the main palace where the king lived, with its walls 12 meters high and one kilometer long, and its large rectangular courtyard surrounded by galleries supported by 248 pillars of 17 meters high. Madurai is reached by train from Nagercoil in 5 hours.